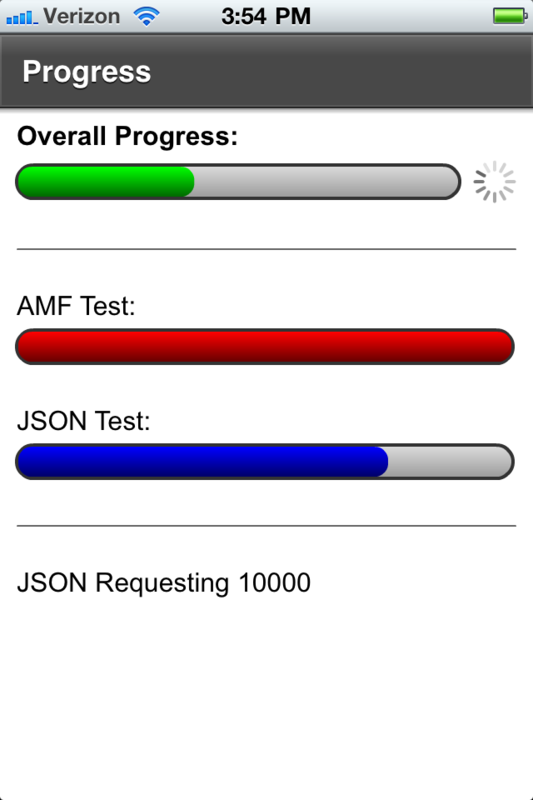 Recently, I’ve been asked more than once which is better: AMF or JSON for AIR mobile applications. 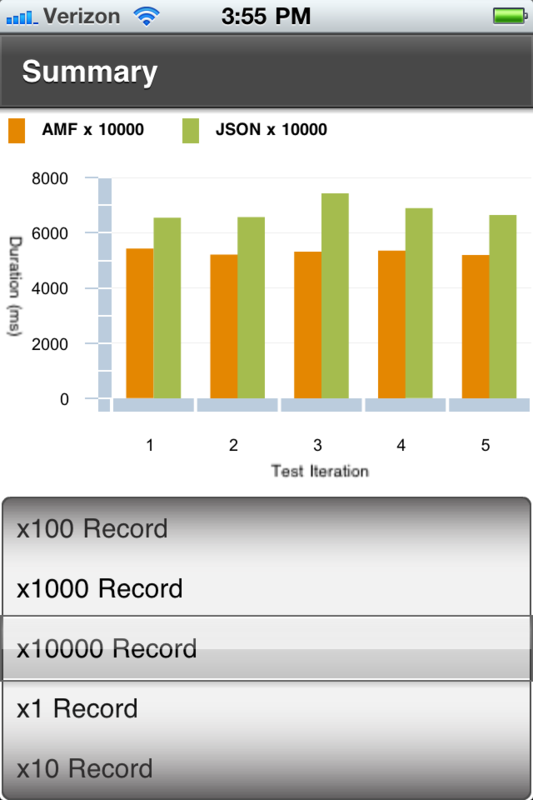 This post is to highlight some performance comparisons, and a sample testing application that I put together. First, it is important to know what both AMF and JSON are. endpoints to communicate through the exchange of strongly typed data. AMF is a binary format that is not easily readable by humans, JSON is a text-based format that is easily readable. 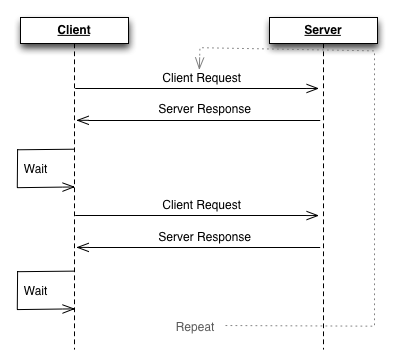 AMF allows for serialization of strongly typed objects in transactions between the client and server, JSON only supports generic or loosely-typed objects. 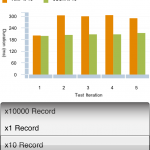 Former Adobe Evangelist James Ward put together a suite of benchmarks comparing JSON, SOAP, and AMF that show comparable performance between AMF and JSON. Recently, AIR 3.0 and Flash Player 11 brought native JSON support, which greatly improves JSON parsing in Flash & AIR runtimes. 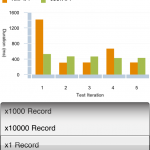 This is a huge boost, especially for mobile applications that consume JSON data. 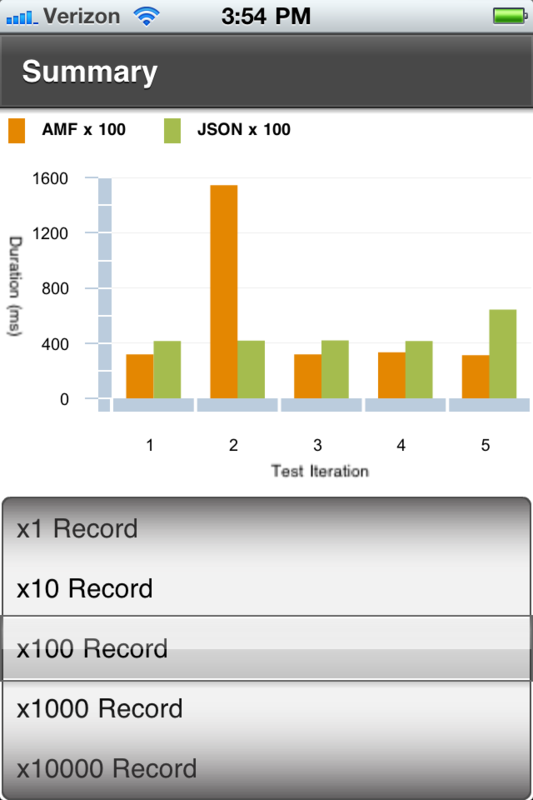 I put together a very basic test case where a mobile application makes requests of simple data objects from a ColdFusion CFC. 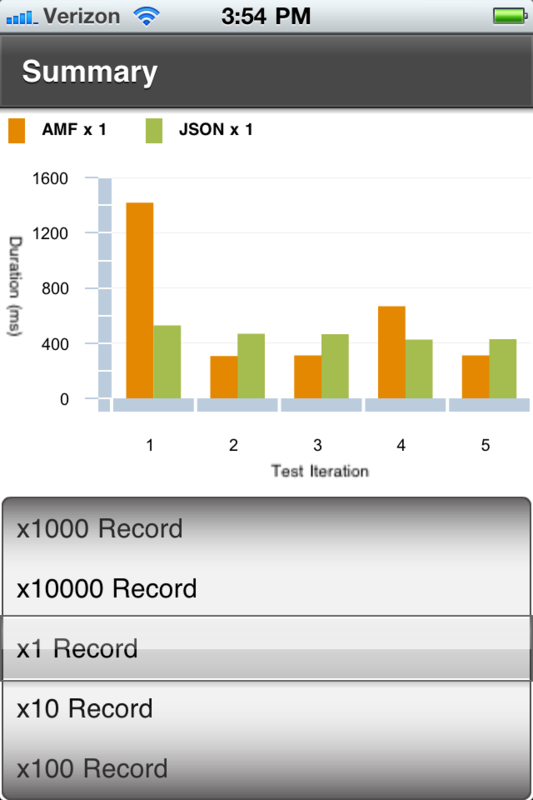 In each test iteration, a request is made for 1, 10, 100, 1000, and 10000 value objects, in both AMF and JSON formats. The total round trip time from request to deserialization is measured and compared for each case, for a total of 5 iterations through each cycle. 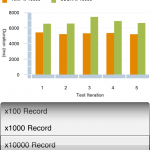 My findings are that AMF and JSON have comparable performance in smaller record sets. However, AMF seems to have better performance as data sets grow. 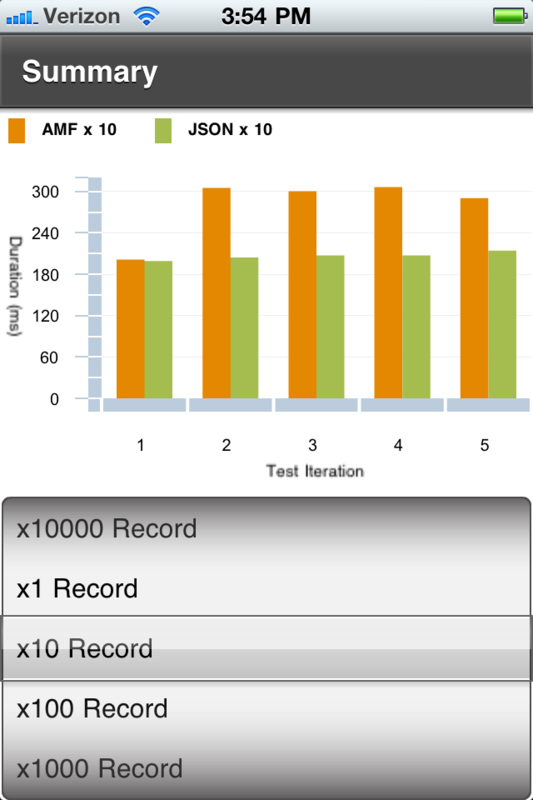 In my test cases, the 1000+ record results were consistently faster using AMF. However, in smaller data sets, JSON was often faster (however not consistently, or by much of a margin). 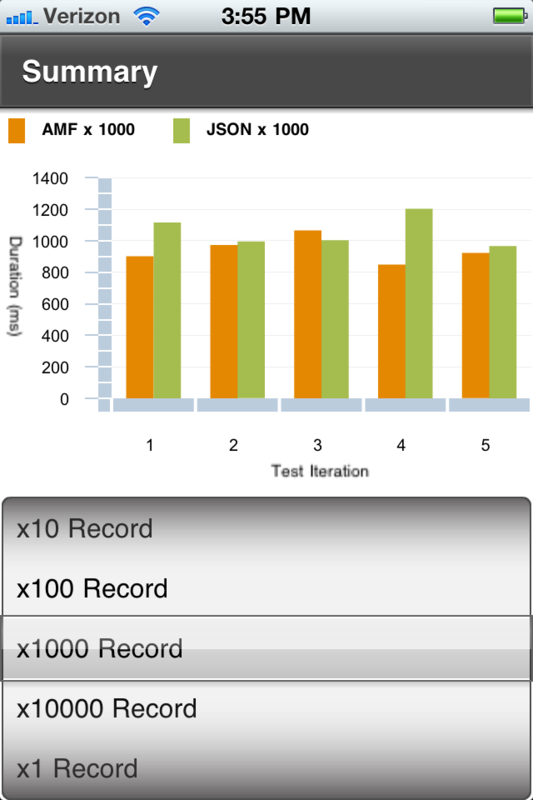 I tested these times on both an iPhone 4 and Motorolla Atrix, both running on the carrier networks (not over wifi). 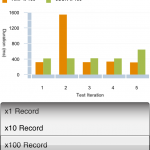 Below is a video of the serialization testing application at work. For these tests I created two basic CFCs (ColdFusion Components). One is a simple data value object. The other CFC is a gateway to expose a remote service that returns the value objects to the client. I chose a ColdFusion CFC for this case b/c it can easily be serialized as AMF or JSON just by changing the endpoint used to consume the service. Obviously, this is a fictional data object with randomly generated values. 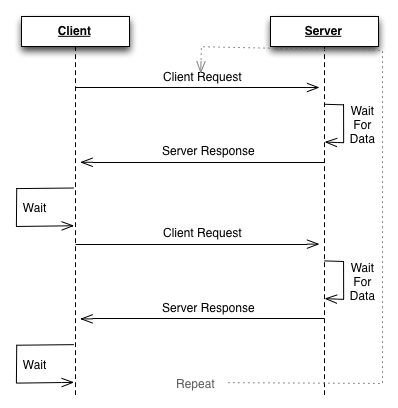 However, it still represents a reasonable service payload for data serialization. By accessing the data via the ColdFusion Flex/Remoting gateway, you access the remote services via AMF3. By accessing the data via an http endpoint, with returnformat=josn, you will invoke the same CFC remote method exposed as JSON. 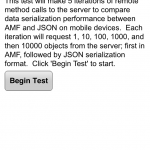 Both JSON and AMF are acceptable serialization formats for mobile applications built with AIR. Both are compact serialization formats that minimize packet size. Both have native parsing/decoding by the AIR runtime. 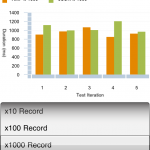 AMF will generally provide better performance for larger data sets. JSON *may* provide marginally better performance for small data sets. AMF also allows for strongly typed object serialization & deserialization, where JSON does not. The answer to the question of “should I use AMF or JSON” is subjective… What kind of data are you returning, and how much data is it? Do you already have AMF services built? Do you already have JSON services built? Are the services consumed by multiple endpoints, with multiple technologies? Do you rely upon strongly typed objects in you development and maintenance processes? 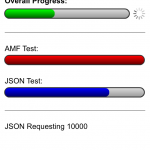 Both AMF and JSON are viable solutions for mobile applications. 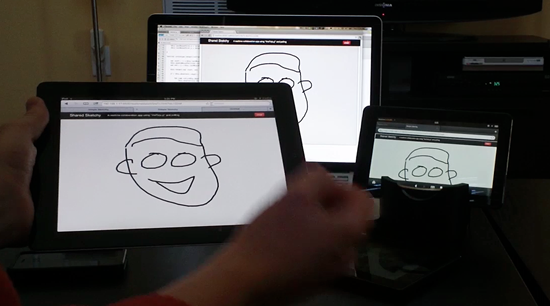 Thanks also to fellow Adobe evangelist Raymond Camden for the CF tips & guidance. A quick reminder that I will be speaking at various events over the next week, so come out to one and learn about Flex for mobile devices and cross-platform development strategies. 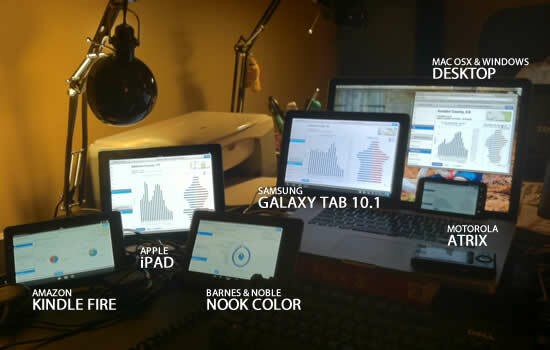 Today I will be speaking at the DC Flex User Group on “Flex for Mobile: One Platform, Lots of Devices” (http://dc-flex.org/topic/flex-mobile-one-platform-lots-devices). In this presentation, Adobe Evangelist Andrew Trice will walk through several applications utilizing Flex and AIR for mobile and will highlight application ecosystems, development processes, device considerations, and many of the “nuts and bolts” of multi-platform development using Adobe’s toolsets. On Monday (Sept 12) I’ll be presenting “More Devices, Less Code”, featuring Flex & AIR for mobile at the DC Tech Meetup (http://www.meetup.com/DC-Tech-Meetup/). On Tuesday (Sept 13) I’ll be presenting “CF Powered Mobile Applications” (http://www.dc-coldfusion.com/index.cfm?event=meetings.showMeeting&meetingId=14). In this session, we will explore mobile application development using Flex and AIR for mobile, powered by ColdFusion backend systems. By the end of this session, you will know how to build natively installed iOS, Android, and BlackBerry Playbook applications, and you will be able to utilize your existing CF skills to power them.